A festive Mexican restaurant at the edge of Old Town San Diego. 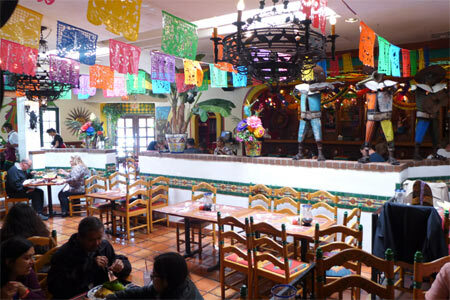 : Walking into Casa Guadalajara's bustling, vibrantly decorated dining room, we thought that the place might be all show and not so much substance. We were wrong. The restaurant, set at the edge of Old Town San Diego, is festive, both indoors and on the lush terrace with fountain, trees, colorful umbrellas and banners. The troubador with guitar and beautiful voice serenaded guests. (A mariachi band also entertains on certain evenings, while holidays and special events feature folklorico dancers.) A basket of warm tortilla chips and salsa arrived almost instantly. The menu has the classics and also some surprise signature dishes. Ceviche a la Duran had the perfect punch of lime and onion to complement the tender fish. The tequila lime shrimp were cooked perfectly with just a hint of tequila flavor in the lime and butter sauce served over Mexican rice. Carne asada and carnitas tacos were flavorful, served in tortillas alongside guacamole, pico de gallo and cilantro. Before or after the meal, take a walk through Old Town to get a feel for the ambiance of circa-1880s San Diego.